A Stationery Studio Exclusive! 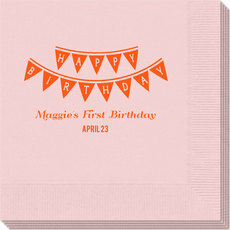 Make meal time extra fun with these trendy birthday placemats. These personalized placemats are available as individual laminated placemats or as a pad of 25 high quality disposable paper placemats you can be proud to use at your next function. Flat printed in ink color and typestyle as shown. Positioning only as shown. Placemats are 17" x 11". 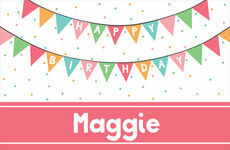 Wording in Banner design "HAPPY BIRTHDAY" will always appear as shown.